Is the 1793 Chain AMERI. Flowing Hair Large Cent a Sleeper Coin? Is This 1793 Cent a Sleeper Coin? One important reason collectors visit my site, US Coin Values Advisor, is to study long term value trends for individual coins, in hope of data mining elusive sleeper coins. As most experienced collectors know, "sleeper coin" is a slang term describing a coin temporarily priced below its true market value, positioned to someday rise significantly in price to properly realign (or establish for the first time) itself in relation to its scarcity, relative to demand. Collectors seek out sleeper coins for the same reason shoppers shove their way into retail stores on Black Friday: Everyone loves a bargain. There are various explanations as to why sleeper coin opportunities exist, but let's save that for another time. One particular date that so happens to also be one of my favorites may well be at this time a sleeper coin: the 1793 Chain AMERI. Flowing Hair Large Cent. Historically, this coin is one of the most important dates in numismatics, as it was the very first United States coin released for general circulation. 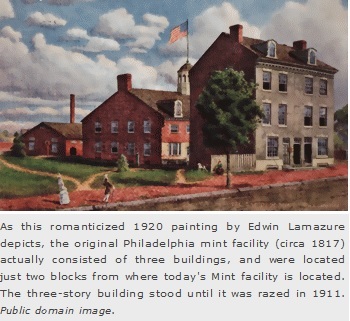 Its birthplace was the first U.S. Mint facility, built in 1792 at the corner of Filbert and Seventh in Philadelphia. The three story building closest to the intersection was the most visible structure of the early Mint and is romanticized today as "Ye Olde Mint". It remained in existence until it was demolished in 1911. Even as far back as 150 years ago, coin scholars noted the importance of the 1793 Chain AMERI. Large Cent. Since then, it has been a cherished key date in American numismatics. Its twin sibling, the 1793 Chain AMERICA Large Cent, is held in similarly high esteem. Together, a total of 36,103 were minted, of which it is estimated that only between 1% and 2% survive today. As the table above demonstrates, the 1793 Chain AMERI. Flowing Hair Large Cent in Good-4 condition was worth about $50.00 in 1950. Today, it is valued at around $10,000. If this were an investment vehicle, you could say it grew at an annual rate of 8.49% over a period of 65 years. Now that is one heckuva record! It's no accident or passing fad that this coin has done so well for so long. As mentioned, it is a truly scarce key date United States coin that collectors really, really want to own. That is the bedrock strength propelling this coin forward. Always has been, and always will be. But if you look carefully at the price data above, you'll note this coin was selling in the $15,000 range in 2006. (For those of you keeping score at home, that was an annual growth rate of 10.72% from 1950 over a 56 year period.) Since then, it has lost one-third of its value. The red line graphs the movement of our "Rare Coin Value Index". The Index is comprised of 87 highly collectible United States coins, covering the full spectrum of denominations from Half Cent to Double Eagle, with January 2000 as its baseline. 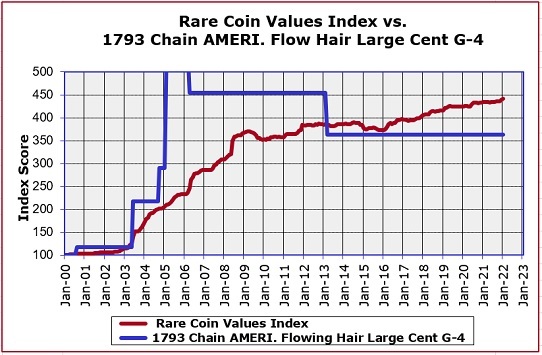 The goal of the Index is to get a feel for the overall direction of the U.S. rare coin market. The 1793 Chain AMERI. Flowing Hair Cent is one of the 87 coins tracked in the Index. The blue line depicts the performance of the 1793 Chain cent. Starting in 2004, it absolutely exploded in value, and by 2006 it was literally ***OFF THE CHART***. This Frightened Lady Liberty was a rock star, indeed! Maybe it rose too much, too fast in value, and some owners couldn't resist the temptation to cash in. For whatever reason, prices fell rather dramatically toward the end of 2006, and have continued drifting slowly downward to its 2015 price tag of $10,000 in G-4 grade. Will the 1793 Chain cent ever again bask in the glory it once enjoyed? Are monkeys good at climbing trees? Is a bat cave creepy? Yes, of course it will! This coin is too special in the hearts and minds of collectors not to get its motor revving again. Its a safe bet that 10 years from now, it will cost you a lot more than it does today to own one of these artifacts from that long gone quaint little "Ye Olde Mint" in Philadelphia. Collectors interested in the 1793 Chain AMERI. Flowing Hair Cent have a few options to find one for sale. One place to check is eBay. I've coded this 1793 Chain cent link to isolate any chain cents currently offered on eBay. As a general rule for a rarity of this nature, buy only examples graded/certified by PCGS, NGC, ICG, or ANACS that are being sold by reputable dealers. There are several very good auction houses that may have examples available as well. Obtain the best grade you can afford. [Disclosure: if you go to eBay from the link above and buy something, I receive a small commission]. Looking for a steal? The 1793 Chain cent may be the quintessential sleeper coin! P.S. Although this particular coin is currently being offered at a discount price, I realize not everyone can write out a check for $10,000 for a coin. I will be reporting on other sleeper coins in the near future that are more affordable to collectors.